The eighty year history of Wyoming’s first state penitentiary, now known as the Wyoming Frontier Prison, is as colorful and elaborate as the plot of a classic western movie. The cornerstone of the prison was laid in 1888, but due to funding issues and Wyoming’s notorious weather, the doors wouldn’t open for thirteen years. In December of 1901, the prison opened and consisted of 104 cells (Cell Block A), no electricity or running water, and very inadequate heating. Throughout the prison’s operation, approximately 13,500 people were incarcerated, including eleven women. Overcrowding was an almost constant concern, and the first of several additions to the penitentiary was completed in 1904, adding 32 cells to the west end of the original cell block (Cell Block A). Women were housed in the prison until 1909, until the last woman was transferred to Colorado. 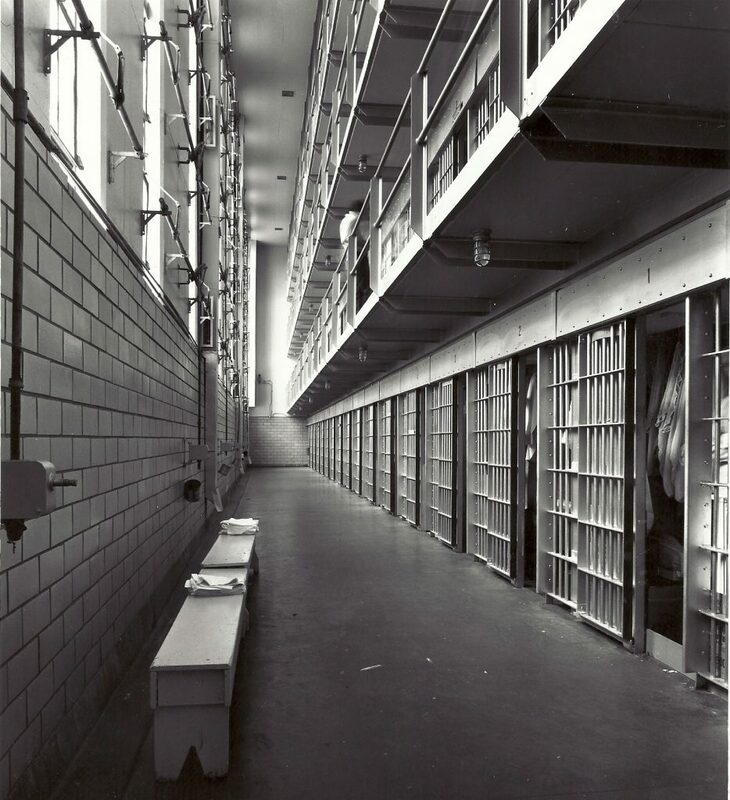 The addition of the second cell block (Cell Block B) in 1950 temporarily relieved the overcrowding, and also included solitary confinement cells, a much more efficient heating system, and hot running water which wouldn’t be installed in the original cell block for another twenty-eight years. A maximum security addition (Cell Block C) was completed in 1966, but the addition only included thirty-six cells and was reserved for serious discipline cases. The prison was equipped with several different means of disciplining inmates throughout its operation, including a dungeon, several variations of solitary confinement and a “punishment pole” to which men were handcuffed and whipped with rubber hoses. The prison also used different execution methods.. The first two executions were carried out using the “traveling” Julien Gallows which were used to hang Tom Horn in Cheyenne in 1903. In 1916, the penitentiary completed the addition of a “death house” which consisted of six cells to house inmates on death row, and a unique indoor version of the Julien Gallows. The building also housed the gas chamber when it was chosen to replace hanging as Wyoming’s execution method of choice in 1936. Ultimately 14 death sentences were carried out; nine men were hanged, and five were executed in the gas chamber by the use of hydrocyanic acid gas. The Wyoming Frontier Prison is a remnant of the grizzly past of the old west, but not every aspect of prison life was so off-putting. Over the 80-year operation, the prison produced goods to meet demands of four major industries. From 1901 through 1917 the prison had a broom factory, but inmates burned it down during a riot. The factory was rebuilt and operated as a shirt factory which brought in twice the revenue to the state. In 1934, a federal law was passed to prohibit the sale and transportation of prison manufactured goods from one state to another, which resulted in the loss of significant revenue when the factory closed. In 1935, the factory began operating as a woolen mill which won the “Navy E” in 1942 for the superior quality blankets produced by the prison for the military during World War II. In 1949 the prison changed production one last time, producing license plates until the penitentiary closed in 1981. After serving the state for eighty years, the prison closed its doors, and sat abandoned until 1987 when a low budget movie titled “Prison” was filmed on location. The movie was one of Viggo Mortensen’s first and featured several other well known actors. Significant damage was done to the prison grounds during filming because it had yet to be considered a historic site. In 1988, a joint powers board assumed ownership of the penitentiary, dubbed it The Wyoming Frontier Prison, and established it as a museum. The Wyoming Frontier Prison has since been listed on The National Registry of Historic Places, and offers tours to approximately 15,000 visitors annually.